Objective To analyse the available evidence on cardiovascular safety of non-steroidal anti-inflammatory drugs. Data sources Bibliographic databases, conference proceedings, study registers, the Food and Drug Administration website, reference lists of relevant articles, and reports citing relevant articles through the Science Citation Index (last update July 2009). Manufacturers of celecoxib and lumiracoxib provided additional data. Study selection All large scale randomised controlled trials comparing any non-steroidal anti-inflammatory drug with other non-steroidal anti-inflammatory drugs or placebo. Two investigators independently assessed eligibility. Data extraction The primary outcome was myocardial infarction. Secondary outcomes included stroke, death from cardiovascular disease, and death from any cause. Two investigators independently extracted data. Data synthesis 31 trials in 116 429 patients with more than 115 000 patient years of follow-up were included. 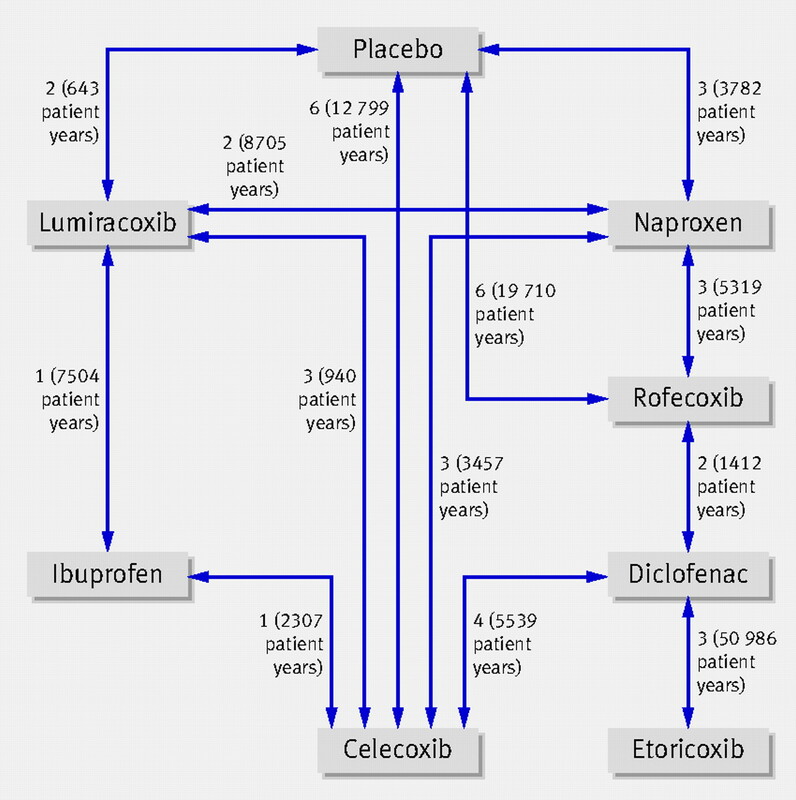 Patients were allocated to naproxen, ibuprofen, diclofenac, celecoxib, etoricoxib, rofecoxib, lumiracoxib, or placebo. Compared with placebo, rofecoxib was associated with the highest risk of myocardial infarction (rate ratio 2.12, 95% credibility interval 1.26 to 3.56), followed by lumiracoxib (2.00, 0.71 to 6.21). Ibuprofen was associated with the highest risk of stroke (3.36, 1.00 to 11.6), followed by diclofenac (2.86, 1.09 to 8.36). Etoricoxib (4.07, 1.23 to 15.7) and diclofenac (3.98, 1.48 to 12.7) were associated with the highest risk of cardiovascular death. Conclusions Although uncertainty remains, little evidence exists to suggest that any of the investigated drugs are safe in cardiovascular terms. Naproxen seemed least harmful. Cardiovascular risk needs to be taken into account when prescribing any non-steroidal anti-inflammatory drug. These debates and the patchwork of evidence resulting from multiple trials and cohort studies have unsettled practising clinicians.7 Several standard meta-analyses were unable to resolve the debate because they failed to integrate all available randomised evidence in one analysis. 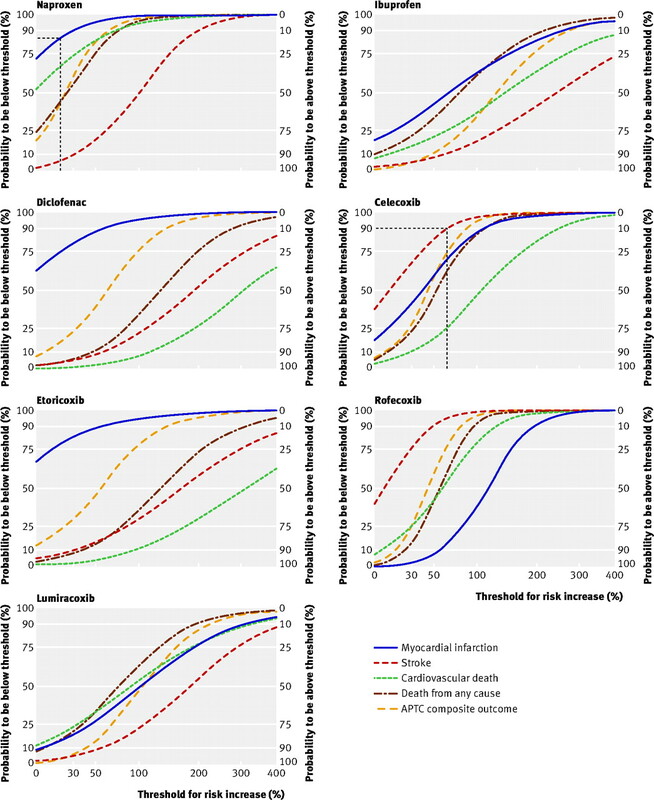 Network meta-analysis allows a unified, coherent analysis of all randomised controlled trials that compare non-steroidal anti-inflammatory drugs head to head or with placebo while fully respecting randomisation.8 9 We analysed the cardiovascular safety of non-steroidal anti-inflammatory drugs by integrating all available direct and indirect evidence in network meta-analyses. We considered large scale randomised controlled trials comparing any non-steroidal anti-inflammatory drug with other non-steroidal anti-inflammatory drugs, paracetamol (acetaminophen), or placebo for any medical condition. To be included, trials required at least two arms with at least 100 patient years of follow-up. In the case of trials with several arms, we included only arms with at least 100 patient years of follow-up. We excluded trials in patients with cancer. For an intervention to be included in our analyses, at least 10 patients allocated to the intervention had to have had a myocardial infarction in all eligible trials combined. We searched bibliographic databases, relevant conference proceedings, study registers, and the FDA website, manually searched reference lists of relevant articles, and retrieved reports citing relevant articles through the Science Citation Index (see web extra appendix 1). The search was last updated in July 2009. Two investigators independently assessed trials for eligibility and extracted data. If a trial was covered in more than one report we used a hierarchy of data sources: reports to the FDA, peer reviewed articles, reports from the web based repository for results of clinical studies www.clinicalstudyresults.org, published abstracts, and other sources, such as trial websites. Finally, we contacted all authors of primary trial reports and manufacturers of relevant non-steroidal anti-inflammatory drugs (Pfizer, Merck, Novartis) for missing outcome data. One independent investigator10 and two manufacturers (Pfizer and Novartis) provided additional information. The prespecified primary outcome was fatal or non-fatal myocardial infarction. Secondary outcomes were haemorrhagic or ischaemic fatal or non-fatal stroke; cardiovascular death, defined as any death due to cardiovascular causes (for example, myocardial infarction, low output failure, fatal arrhythmia, pulmonary embolism, stroke), and death of unknown cause; death from any cause; and the Antiplatelet Trialists’ Collaboration composite outcome11 of non-fatal myocardial infarction, non-fatal stroke, or cardiovascular death. Whenever possible we used results from intention to treat analysis of the longest follow-up available. We excluded comparisons with zero events in both groups from the relevant analysis since such comparisons provide no information on the magnitude of the treatment effect.12 We used a Bayesian random effects model, which fully preserves randomised treatment comparisons within trials.9 13 14 Analyses were done using Markov chain Monte Carlo methods with minimally informative prior distributions. As measures of treatment effects, we calculated rate ratios based on patient years. We estimated rate ratios from the median of the posterior distribution as well as corresponding 95% credibility intervals. In the presence of minimally informative priors, credibility intervals can be interpreted like conventional confidence intervals. Rate ratios below 1 indicate a detrimental effect of the control intervention throughout. Finally, we calculated confidence levels, defined as the posterior probability that an increase in risk is smaller than a specified threshold.15 Confidence levels take into account both the magnitude of the pooled rate ratio and the corresponding uncertainty. Precise estimates are more informative and result in sharp increases in the confidence that the rate ratio of a drug does not exceed a specified threshold. When the specified threshold of the rate ratio increases, imprecise estimates that are based on low numbers of events are uninformative and lead to slow increases in confidence and relevant uncertainty even for large rate ratios. We prespecified a rate ratio of 1.3 as the primary threshold, which was used as non-inferiority margin in the Multinational Etoricoxib and Diclofenac Arthritis Long-term (MEDAL) programme.16 We used linear regression to test for each outcome whether there was any association with cyclo-oxygenase-2 selectivity (data only shown in web extra appendix 2). We assessed the goodness of fit of the model to the data by calculating the residual deviance,9 the heterogeneity of treatment effects estimated from the median between trial variance τ2 observed in the posterior distribution, and the consistency of the network determined by use of inconsistency factors,17 defined as the difference in log rate ratios derived from direct and indirect comparisons. To check the robustness of our analyses, we calculated Bayesian random effects meta-analyses for all available direct comparisons and carried out several sensitivity analyses, including a restriction to trials in patients with musculoskeletal conditions (data shown in web extra appendix 2). For all analyses we used Stata release 10, and WinBUGS version 1.4 (MRC Biostatistics Unit, Cambridge, UK). Web extra appendix 1 provides further details of the methods used. Thirty one randomised controlled trials evaluating seven different non-steroidal anti-inflammatory drugs were included in the analyses (table 1⇓, fig 1⇓). Celecoxib was investigated most (15 trials) and compared with five different interventions. Ibuprofen was evaluated least (two trials) and compared with two different interventions, whereas etoricoxib was evaluated in three trials but compared with only one intervention. Etoricoxib and diclofenac had the largest number of patient years of follow-up (26 025 and 27 819 overall, respectively), whereas ibuprofen had the lowest number of patient years of follow-up (4832 overall). In total, 116 429 patients with 117 218 patient years of follow-up were covered in the analysis of the primary outcome (table 2⇓). The methodological quality of included trials was generally high with all but two having adequate concealment of allocation, all having adequate blinding of patients and investigators, 16 having independent event adjudication, and 13 including all randomised patients in the analysis (table 1). Twenty nine trials with 554 accumulated events contributed to the analysis of myocardial infarction (table 2). For three of the preparations (naproxen, diclofenac, and etoricoxib) evidence was lacking for an increased risk of myocardial infarction compared with placebo (fig 2⇓). All other drugs seemed to be associated with an increased risk compared with placebo. Estimated rate ratios were greater than 1.3 for ibuprofen (1.61, 95% credibility interval 0.50 to 5.77), celecoxib (1.35, 0.71 to 2.72), rofecoxib (2.12, 1.26 to 3.56), and lumiracoxib (2.00, 0.71 to 6.21). Twenty six trials with 377 accumulated events contributed to the analysis of stroke (table 2). All drugs seemed to be associated with an increased risk compared with placebo (fig 2). Estimated rate ratios were greater than 1.3 for naproxen (1.76, 0.91 to 3.33), ibuprofen (3.36, 1.00 to 11.60), diclofenac (2.86, 1.09 to 8.36), etoricoxib (2.67, 0.82 to 8.72), and lumiracoxib (2.81, 1.05 to 7.48). Twenty six trials with 312 accumulated events contributed to the analysis of cardiovascular death, accounting for 46% of all deaths (table 2). All drugs except naproxen showed some evidence for an increased risk of cardiovascular death compared with placebo (fig 2). The estimated rate ratios for cardiovascular death were greater than 1.3 for ibuprofen (2.39, 0.69 to 8.64), diclofenac (3.98, 1.48 to 12.70), celecoxib (2.07, 0.98 to 4.55), etoricoxib (4.07, 1.23 to 15.70), rofecoxib (1.58, 0.88 to 2.84), and lumiracoxib (1.89, 0.64 to 7.09). Twenty eight trials with 676 accumulated events contributed to the analysis on overall mortality (table 2). All the drugs seemed to be associated with increased risks of death from any cause compared with placebo (fig 2). The estimated rate ratios were greater than 1.3 for ibuprofen (1.77, 0.73 to 4.30), diclofenac (2.31, 1.00 to 4.95), celecoxib (1.50, 0.96 to 2.54), etoricoxib (2.29, 0.94 to 5.71), rofecoxib (1.56, 1.04 to 2.23), and lumiracoxib (1.75, 0.78 to 4.17). Thirty trials with 1091 accumulated events contributed to the analysis on the Antiplatelet Trialists’ Collaboration composite outcome (table 2). All drugs seemed to be associated with increased risks of the composite of non-fatal myocardial infarction, non-fatal stroke, or cardiovascular death compared with placebo (fig 2). The estimated rate ratios were greater than 1.3 for ibuprofen (2.26, 1.11 to 4.89), diclofenac (1.60, 0.85 to 2.99), celecoxib (1.43, 0.94 to 2.16), etoricoxib (1.53, 0.74 to 3.17), rofecoxib (1.44, 1.00 to 1.99), and lumiracoxib (2.04, 1.13 to 4.24). Figure 3⇓ presents an overview of pairwise comparisons (rate ratios with 95% credibility intervals) of all drugs on all outcomes. Figure 4⇓ presents posterior probability curves with resulting confidence levels for the different drugs compared with placebo and different outcomes. For example, the probability that rofecoxib increases the risk of myocardial infarction by less than 30% is 3% or conversely there is 97% confidence that rofecoxib increases the risk by at least 30% (corresponding to a rate ratio of 1.3). The curves can also be used to examine the overall pattern of available evidence of a specific drug. For example, the relatively steep increases in all but one of the posterior probability curves for naproxen points to the robust evidence available for naproxen. In contrast, the relatively flat curves for etoricoxib indicate a relative lack of available evidence. However, the mostly large effects seen for etoricoxib (indicated by the right shift of the curves) nevertheless allow conclusions for clinically relevant risk increases. The model fit was good for all outcomes (see web extra appendix 2). Estimates of statistical heterogeneity between direct comparisons were generally low, except for myocardial infarction (range of τ2 across outcomes: 0.03 to 0.12; see web extra appendix 2). Inconsistency between direct and indirect comparisons was low for all outcomes (range of median inconsistency factors 2% to 29%; see web extra appendix 2). However, given the relatively low number of trials and events, relevant heterogeneity or inconsistency between trials could not be ruled out. Detailed results of the sensitivity analyses are presented in web extra appendix 2: results were all compatible with main analyses. Many of the estimates were imprecise, however, and do not allow for firm conclusions to be drawn. 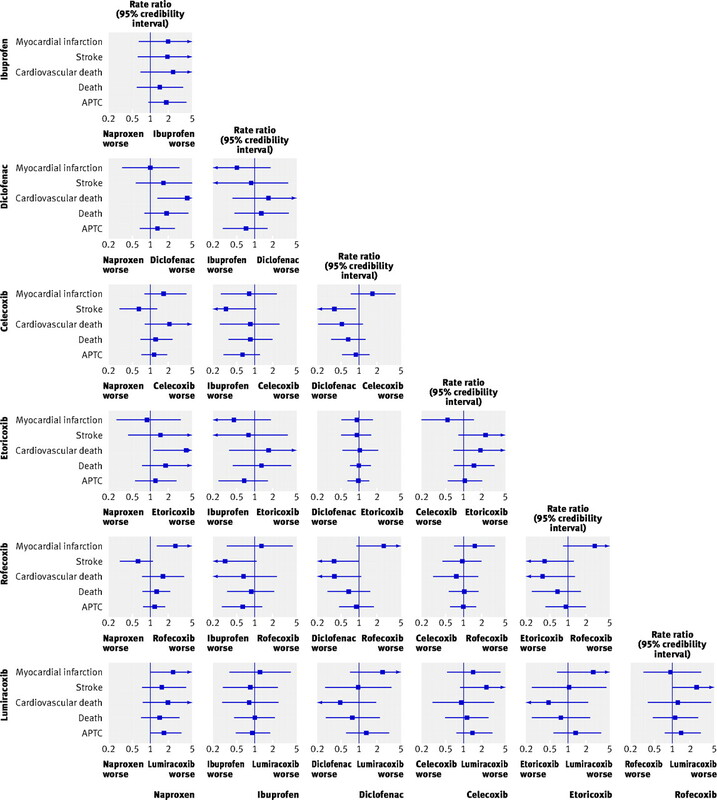 In this network meta-analysis of cardiovascular safety data of seven non-steroidal anti-inflammatory drugs and placebo, naproxen seemed least harmful (fig 3). Safety profiles of individual drugs varied considerably depending on the outcome, and estimated rate ratios for comparisons with placebo were generally imprecise. Non-steroidal anti-inflammatory drugs are mainly used for symptomatic treatment of musculoskeletal conditions. Clearly, as for any symptomatic treatment, doing more harm than good with this class of drugs should be avoided (primum non nocere). Taking this into account, we presented confidence levels (fig 4), which can be interpreted as confidence that a drug is associated with an increase in risk that is smaller than a specified threshold. For the primary outcome of myocardial infarction, the confidence that the increase in risk associated with the evaluated non-steroidal anti-inflammatory drugs does not exceed 30% (the risk increase used as non-inferiority margin in the Multinational Etoricoxib and Diclofenac Arthritis Long-term programme 16) is sufficiently high only for naproxen. Conversely, we are confident that several other drugs—ibuprofen, diclofenac, etoricoxib, and lumiracoxib—are associated with a risk increase of more than 30% on several cardiovascular outcomes. Although our analysis covered more than 100 000 patient years of follow-up, the number of events for most outcomes was low and our estimates of rate ratios imprecise, as indicated by wide credibility intervals. Given the low event rates in the included trials, establishing the cardiovascular safety of a preparation with sufficient precision would require a trial with more than 100 000 patients followed up for at least one year. Such a large trial may be difficult to carry out, considering the limited amount of funding available and the inherent ethical problems. Although estimated rate ratios indicated harmful effects in most drugs on the majority of outcomes, conventional levels of statistical significance were reached in about 30% of comparisons with placebo. Absence of statistically robust evidence of a harmful effect should not be confused with evidence of absence of cardiovascular toxicity for the evaluated drugs.18 Posterior probabilities may increase our understanding of cardiovascular safety data in this situation and allow for different notions about what constitutes a clinically relevant increase in risk. Most will agree that a rate ratio of 1.3 indicates a clinically relevant increase in risk as was used as the upper bound of the non-inferiority margin by studies in the Multinational Etoricoxib and Diclofenac Arthritis Long-term programme,16 and we are confident that several drugs are associated with a risk increase higher than this margin for several outcomes. Our analysis has several limitations. Firstly, we were unable to consider all non-steroidal anti-inflammatory drugs in our analysis: large scale randomised controlled trials are lacking for most of the older drugs and even for some newer ones, such as valdecoxib or meloxicam. Nevertheless, we were able to include all relevant cyclo-oxygenase-2 inhibitors, except valdecoxib, and the three most commonly used traditional non-steroidal anti-inflammatory drugs.20 21 By disregarding small studies we minimised the risk of small study effects.22 Small studies would have had minimal impact on the analysis anyway, because of low numbers of events.23 Secondly, we were able to obtain unpublished data only for the trials of celecoxib and lumiracoxib, whereas Merck, the manufacturer of rofecoxib and etoricoxib, was not willing to provide unpublished safety data. Therefore some data were missing for trials sponsored by Merck. This is disconcerting in the light of the safety concerns raised by our analysis for both drugs, rofecoxib and etoricoxib, manufactured by Merck. Thirdly, the quality of our analysis is limited by the quality of the underlying data. Although the methodological quality of included trials was generally satisfactory, the quality of reporting was often less than optimal24 and we found discrepancies in the reported number of events between different sources of information for major trials including ADVANTAGE (Assessment of Differences between Vioxx and Naproxen To Ascertain Gastrointestinal Tolerability and Effectiveness), VIGOR (Vioxx Gastrointestinal Outcomes Research), and APPROVe (Adenomatous Polyp Prevention on Vioxx).3 25 26 27 Several trials lacked independent adjudication of events, therefore bias in either direction cannot be excluded, including bias towards the null owing to non-differential misclassification of events or assessor bias in trials without independent adjudication.4 23 Nevertheless, the analysis restricted to trials with independent adjudication of events supported the robustness of our main analysis (see web extra appendix 2). Fourthly, one study explored the effects of dosage and regimen in a pooled analysis of six randomised placebo controlled trials of celecoxib and found that lower dosages and once daily regimens that avoided continuous interference of the drug with prostaglandin metabolism were associated with lower relative risks for the cardiovascular composite outcome than higher dosages and twice daily regimens.28 We were unable to satisfactorily deal with these matters in our analysis mainly because of the complexity of the network and the low number of patients treated with low dosages. In addition, regimens used in clinical practice might differ from the regimens used in the included clinical trials. Intermittent usage seems to be more common in clinical practice than the chronic long term usage in the trials, resulting in less intense drug use.29 Because none of the trials used intermittent regimens and drugs were used for at least one year in most of the trials we were unable to investigate the impact of drug use on cardiovascular outcomes. Data from the General Practice Research Database indicate, however, that about half of the patients have patterns of drug intake comparable to those evaluated in the trials included in this network meta-analysis,29 and we submit that the results of our study are applicable to these patients. Finally, we carried out several sensitivity analyses to determine the robustness of the results. Unfortunately, owing to the low number of accumulated events, estimates from these analyses were imprecise and do not allow any meaningful conclusion. This is particularly true for the analysis restricted to patients with musculoskeletal conditions: many of the point estimates could not be derived at all and others seemed to contradict the main results, but credibility intervals were compatible with both, major benefits or detrimental harms. We used a comprehensive search strategy and searched pertinent sources to retrieve potentially eligible randomised controlled trials.30 It therefore seems unlikely that we missed any relevant trial. Using network meta-analysis we were able to integrate all available randomised evidence on the cardiovascular safety of non-steroidal anti-inflammatory drugs in one analysis while fully preserving randomisation.31 The integration of direct and indirect comparisons results in a gain of statistical precision compared with previous analyses4 23 and allows for formal comparisons of non-steroidal anti-inflammatory drugs with placebo. In the most comprehensive analysis to date, one study compared five cyclo-oxygenase-2 selective inhibitors with placebo using conventional techniques.23 They found all estimates of relative risks of cardiovascular death imprecise and largely overlapping the null effect line, compatible with substantial harms or benefits. In contrast, our estimates were more precise compared with that study, which estimated a nearly identical rate ratio for the comparison of etoricoxib and placebo for the outcome cardiovascular death (rate ratio 4.4 v 4.07 in our analysis). However, the confidence interval in that meta-analysis ranged from 0.2 to 119 whereas our credibility interval ranged from 1.23 to 15.7, providing stronger evidence for increases in the risk of cardiovascular death. Also, wide confidence intervals around estimates for lumiracoxib did not allow for a conclusion on any of the outcomes in their analysis. In contrast, our analysis provided smaller intervals, and posterior probabilities indicated a high probability that lumiracoxib is associated with a clinically relevant increase in risk of cardiovascular outcomes. The observation that cardiovascular risk is not clearly associated with specificity of cyclo-oxygenase-2 inhibitors implies that no prediction of cardiovascular risk can be made based on such specificity. Therefore the use of other non-steroidal anti-inflammatory drugs not covered by our analysis should be reconsidered, as well as the over the counter availability of non-steroidal anti-inflammatory drugs such as diclofenac or ibuprofen. In general, naproxen seems to be the safest analgesic for patients with osteoarthritis in cardiovascular terms but this advantage has to be weighed against gastrointestinal toxicity and the need for concomitant prescription of a proton pump inhibitor in many patients. In the light of the results of one study,28 celecoxib 400 mg prescribed once daily may be considered as an alternative option. Other alternatives include paracetamol and opioids. Compared with placebo, however, paracetamol results in only a small reduction in pain and may be associated with clinically relevant hepatotoxicity, even in dosages recommended for musculoskeletal pain.42 43 The analgesic effect of opioids is somewhat more pronounced but outweighed by large increases in the risk of adverse events.44 In conclusion, the options for the treatment of chronic musculoskeletal pain are limited and patients and clinicians need to be aware that cardiovascular risk needs to be taken into account when prescribing. We thank all independent trialists, Novartis, and Pfizer for providing unpublished data and Malcom Sturdy for development of the database. Contributors: ST and SR contributed equally to this work. ST, SR, SW, and PJ had full access to all of the data in the study and take responsibility for the integrity of the data and the accuracy of the data analysis. PJ conceived and designed the study. ST, SR, and BT acquired the data. All authors analysed and interpreted the data. ST, SR, and PJ drafted the manuscript. SW, PH, BT, PMV, and ME critically revised the manuscript for important intellectual content. ST, SW, and PJ carried out the statistical analysis. SR, ME and PJ obtained funding. SR, PH, BT, PMV, ME, and PJ provided administrative support. PJ supervised the study. Funding: SR, ME, and PJ received grants (Nos 4053-40-104762/3 and 3200-066378) from the Swiss National Science Foundation’s national research programme 53 on musculoskeletal health. PJ was a programme for social medicine, preventive and epidemiological research senior research fellow funded by the Swiss National Science Foundation (grant No 3233-066377). CTU Bern is supported by the Swiss National Science Foundation. The Swiss National Science Foundation, had no role in the study design, data collection, data analysis, data interpretation, writing of the manuscript, or decision to submit the manuscript. Competing interests: All authors have completed the Unified Competing Interest form at www.icmje.org/coi_disclosure.pdf (available on request from the corresponding author) and declare: no support from any institution for the submitted work besides the funding as described above; no financial relationships with any institutions that might have an interest in the submitted work in the previous 3 years; no other relationships or activities that could appear to have influenced the submitted work. Dai C, Stafford RS, Alexander GC. National trends in cyclooxygenase-2 inhibitor use since market release: nonselective diffusion of a selectively cost-effective innovation. Arch Intern Med2005;165:171-7. Kaufman DW, Kelly JP, Rosenberg L, Anderson TE, Mitchell AA. Recent patterns of medication use in the ambulatory adult population of the United States: the Slone survey. JAMA2002;287:337-44. Bresalier RS, Sandler RS, Quan H, Bolognese JA, Oxenius B, Horgan K, et al. Cardiovascular events associated with rofecoxib in a colorectal adenoma chemoprevention trial. N Engl J Med2005;352:1092-102. Juni P, Nartey L, Reichenbach S, Sterchi R, Dieppe PA, Egger M. Risk of cardiovascular events and rofecoxib: cumulative meta-analysis. Lancet2004;364:2021-9. McGettigan P, Henry D. Cardiovascular risk and inhibition of cyclooxygenase: a systematic review of the observational studies of selective and nonselective inhibitors of cyclooxygenase 2. JAMA2006;296:1633-44. Avorn J. Keeping science on top in drug evaluation. N Engl J Med2007;357:633-5. Borer JS. Cyclooxygenase inhibition: what should we do to resolve the confusion? An American perspective. J Cardiovasc Pharmacol2006;47:S87-91. Psaty BM, Lumley T, Furberg CD, Schellenbaum G, Pahor M, Alderman MH, et al. Health outcomes associated with various antihypertensive therapies used as first-line agents: a network meta-analysis. JAMA2003;289:2534-44. Aisen PS, Schafer KA, Grundman M, Pfeiffer E, Sano M, Davis KL, et al. Effects of rofecoxib or naproxen vs placebo on Alzheimer disease progression: a randomized controlled trial. JAMA2003;289:2819-26. Collaborative overview of randomised trials of antiplatelet therapy—I: prevention of death, myocardial infarction, and stroke by prolonged antiplatelet therapy in various categories of patients. Antiplatelet Trialists’ Collaboration. BMJ1994;308:81-106. Sweeting MJ, Sutton AJ, Lambert PC. What to add to nothing? Use and avoidance of continuity corrections in meta-analysis of sparse data. Stat Med2004;23:1351-75. Higgins JP, Whitehead A. Borrowing strength from external trials in a meta-analysis. Stat Med1996;15:2733-49. Shakespeare TP, Gebski VJ, Veness MJ, Simes J. Improving interpretation of clinical studies by use of confidence levels, clinical significance curves, and risk-benefit contours. Lancet2001;357:1349-53. Cannon CP, Curtis SP, FitzGerald GA, Krum H, Kaur A, Bolognese JA, et al. Cardiovascular outcomes with etoricoxib and diclofenac in patients with osteoarthritis and rheumatoid arthritis in the Multinational Etoricoxib and Diclofenac Arthritis Long-term (MEDAL) programme: a randomised comparison. Lancet2006;368:1771-81. Lu GB, Ades AE. Assessing evidence inconsistency in mixed treatment comparisons. J Am Stat Assoc2006;101:447-59. Altman DG, Bland JM. Absence of evidence is not evidence of absence. BMJ1995;311:485. Ray WA, Stein CM, Daugherty JR, Hall K, Arbogast PG, Griffin MR. COX-2 selective non-steroidal anti-inflammatory drugs and risk of serious coronary heart disease. Lancet2002;360:1071-3. Fries JF, Murtagh KN, Bennett M, Zatarain E, Lingala B, Bruce B. The rise and decline of nonsteroidal antiinflammatory drug-associated gastropathy in rheumatoid arthritis. Arthritis Rheum2004;50:2433-40. Paulose-Ram R, Hirsch R, Dillon C, Gu Q. Frequent monthly use of selected non-prescription and prescription non-narcotic analgesics among US adults. Pharmacoepidemiol Drug Saf2005;14:257-66. Kearney PM, Baigent C, Godwin J, Halls H, Emberson JR, Patrono C. Do selective cyclo-oxygenase-2 inhibitors and traditional non-steroidal anti-inflammatory drugs increase the risk of atherothrombosis? Meta-analysis of randomised trials. BMJ2006;332:1302-8. Correction: report of specific cardiovascular outcomes of the ADVANTAGE trial. Ann Intern Med2006;144:943. Curfman GD, Morrissey S, Drazen JM. Expression of concern reaffirmed. N Engl J Med2006;354:1193. Baron JA, Sandler RS, Bresalier RS, Lanas A, Morton DG, Riddell R, et al. Cardiovascular events associated with rofecoxib: final analysis of the APPROVe trial. Lancet2008;372:1756-64. Solomon SD, Wittes J, Finn PV, Fowler R, Viner J, Bertagnolli MM, et al. Cardiovascular risk of celecoxib in 6 randomized placebo-controlled trials: the cross trial safety analysis. Circulation2008;117:2104-13. Van Staa TP, Leufkens HG, Zhang B, Smeeth L. A comparison of cost effectiveness using data from randomized trials or actual clinical practice: selective cox-2 inhibitors as an example. PLoS Med2009;6:e1000194. Egger M, Juni P, Bartlett C, Holenstein F, Sterne J. How important are comprehensive literature searches and the assessment of trial quality in systematic reviews? Empirical study. Health Technol Assess2003;7:1-76. Caldwell DM, Ades AE, Higgins JP. Simultaneous comparison of multiple treatments: combining direct and indirect evidence. BMJ2005;331:897-900. Hippisley-Cox J, Coupland C. Risk of myocardial infarction in patients taking cyclo-oxygenase-2 inhibitors or conventional non-steroidal anti-inflammatory drugs: population based nested case-control analysis. BMJ2005;330:1366. Cairns JA. The coxibs and traditional nonsteroidal anti-inflammatory drugs: a current perspective on cardiovascular risks. Can J Cardiol2007;23:125-31. Wolfe F, Flowers N, Burke TA, Arguelles LM, Pettitt D. Increase in lifetime adverse drug reactions, service utilization, and disease severity among patients who will start COX-2 specific inhibitors: quantitative assessment of channeling bias and confounding by indication in 6689 patients with rheumatoid arthritis and osteoarthritis. J Rheumatol2002;29:1015-22. Chou R, Fu R, Carson S, Saha S, Helfand M. Methodological shortcomings predicted lower harm estimates in one of two sets of studies of clinical interventions. J Clin Epidemiol2007;60:18-28. Grosser T, Fries S, FitzGerald GA. Biological basis for the cardiovascular consequences of COX-2 inhibition: therapeutic challenges and opportunities. J Clin Invest2006;116:4-15. Fitzgerald GA. Coxibs and cardiovascular disease. N Engl J Med2004;351:1709-11. Hermann M, Camici G, Fratton A, Hurlimann D, Tanner FC, Hellermann JP, et al. Differential effects of selective cyclooxygenase-2 inhibitors on endothelial function in salt-induced hypertension. Circulation2003;108:2308-11. Sowers JR, White WB, Pitt B, Whelton A, Simon LS, Winer N, et al. The effects of cyclooxygenase-2 inhibitors and nonsteroidal anti-inflammatory therapy on 24-hour blood pressure in patients with hypertension, osteoarthritis, and type 2 diabetes mellitus. Arch Intern Med2005;165:161-8. Zhang J, Ding EL, Song Y. Adverse effects of cyclooxygenase 2 inhibitors on renal and arrhythmia events: meta-analysis of randomized trials. JAMA2006;296:1619-32. Harirforoosh S, Aghazadeh-Habashi A, Jamali F. Extent of renal effect of cyclo-oxygenase-2-selective inhibitors is pharmacokinetic dependent. Clin Exp Pharmacol Physiol2006;33:917-24. Zhang W, Jones A, Doherty M. Does paracetamol (acetaminophen) reduce the pain of osteoarthritis? A meta-analysis of randomised controlled trials. Ann Rheum Dis2004;63:901-7. Kuehn BM. FDA focuses on drugs and liver damage: labeling and other changes for acetaminophen. JAMA2009;302:369-71. Nuesch E, Rutjes AW, Husni E, Welch V, Juni P. Oral or transdermal opioids for osteoarthritis of the knee or hip. Cochrane Database Syst Rev2009;4:CD003115.